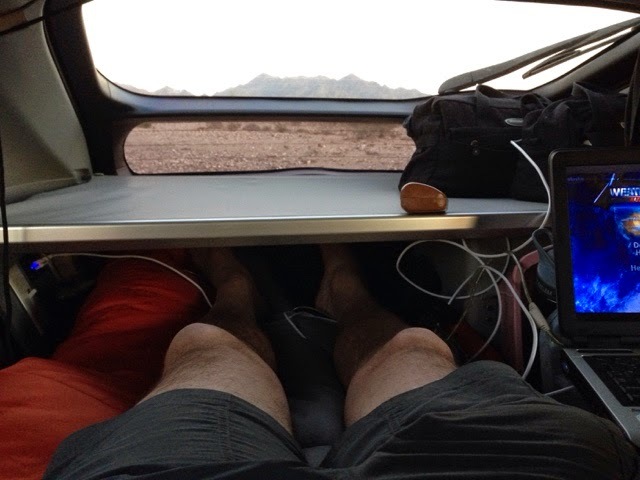 Last night I said goodbye to my Vandweller friends here in Tucson as I was leaving by 6:00 this morning. I told them i will be back in a couple of weeks. 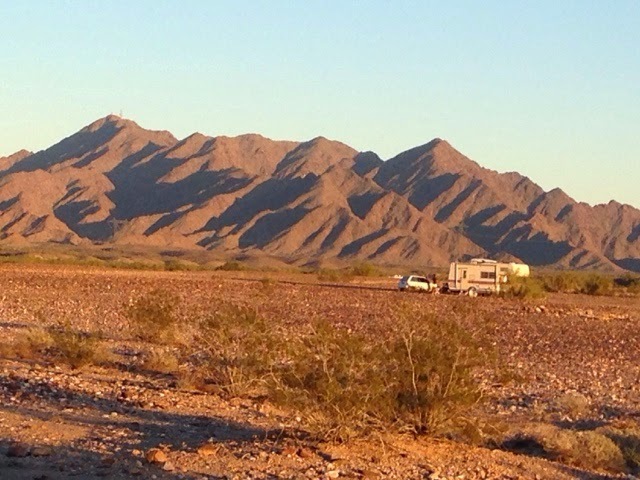 I have about a 275 mile drive to my destination to meet up with a different Vandweller group in Ehrenburg on the Colorado River. Although I was out of the parking lot before 6 I did stop for my podcast downloads for my drive McDonalds. 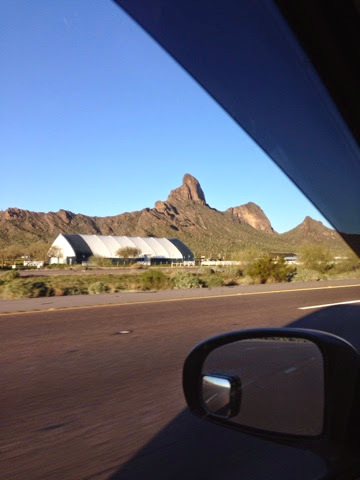 The route i take is entirely on I10 and takes me through Phoenix, where I planning on spending a couple of days when I come back. 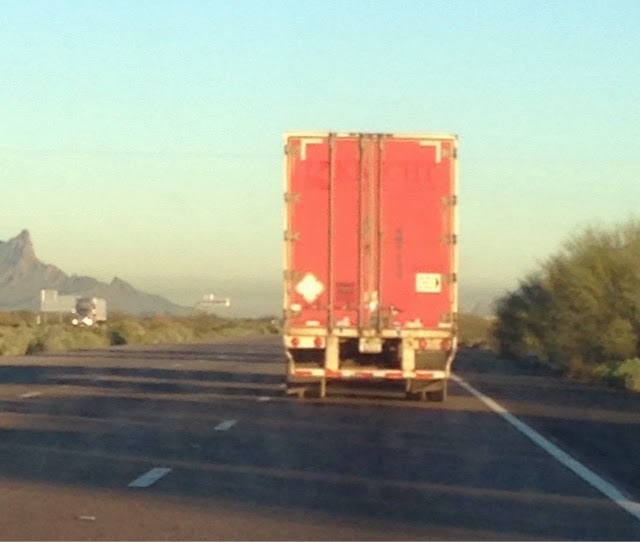 As you can see it was a nice clear morning as the weather has been every day since I arrived in AZ. 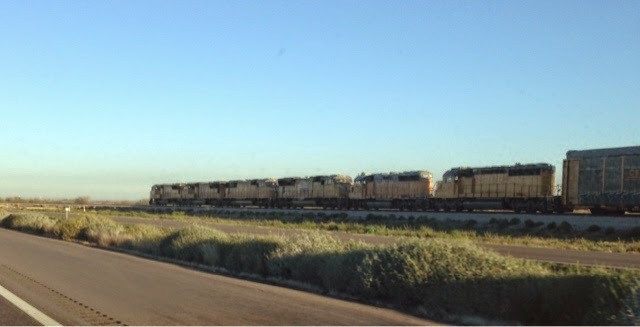 The CSX train follows I10 and then goes towards I8 towards Yuma, AZ. 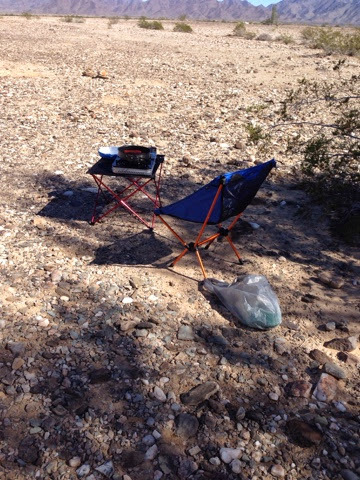 I stopped in Quartzite at the Dollar General for some supplies for my stay in the desert. 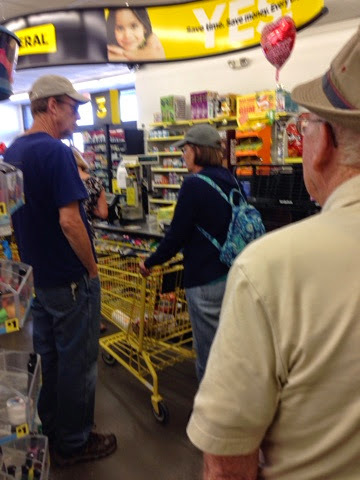 Although most of the people have left from the winter gathering, the store was very crowded having to wait 20 minutes to check out. There is no grocery store in town so markets are all you have. When I arrived at the BLM (Bureau of Land Management) gathering site in the dispersed area. I first looked up Vandweller Bob Wells who loosely organizes the gathering. Bob has just recently been featured in a documentary on the Vandwelling life. He has also written a book on the subject and runs the blog I follow. As I was leaving Bob's camp I met Suanne who I wanted to also meet as she also Vandwells in her Prius. She came from Washington State and we planned to meet here and we arrived only a few minutes apart. 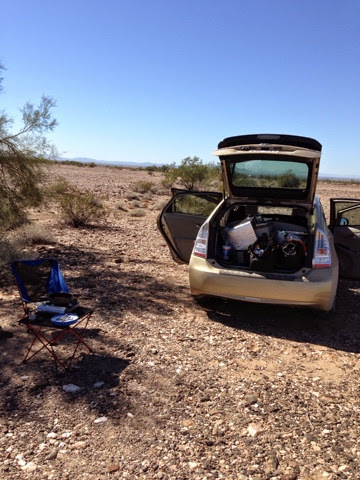 Suanne and I got to visit for awhile and compare our Prius setups. She also blogs about her Prius travels. I made dunch (dinner/lunch) usung my mini chair & table. It worked great for my stove cooking. Beans and hotdogs today to use up the things that I have open. One issue when traveling by yourself is that food that is packaged comes in a size that is larger than one meal. That why I am glad I have s fridge to keep food fresh and use the extra another day. 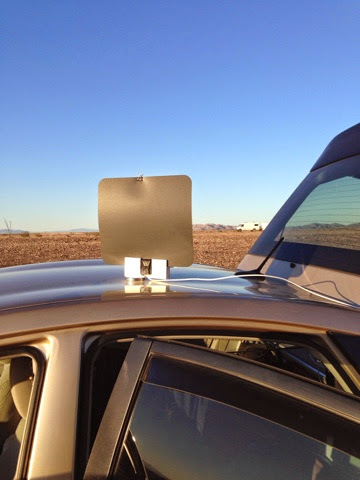 I set up my flat Amplifed antenna in the magnetic stand that I made for putting it up on the roof. 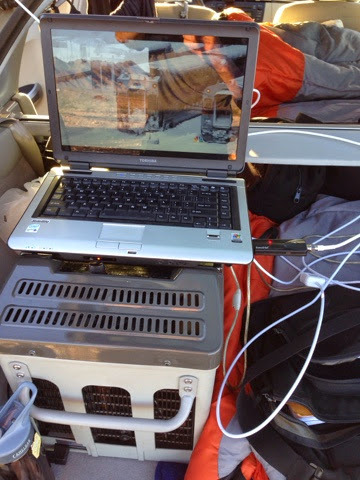 Have the TV set up in the hatch area out of the sun to watch the news. It will go inside when it gets dark. 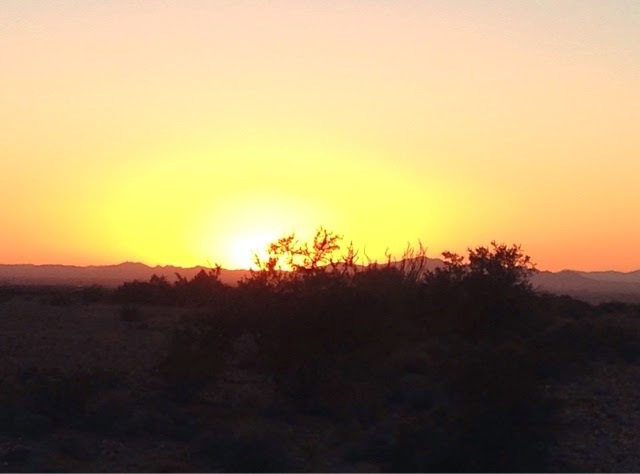 Setting sunlight hitting the mountains here in the desert. Sitting on my bed watching TV and writing my blog.